Congregations band together, improvise, as Jewish New Year approaches. A few weeks ago, Holly Davies was getting ready to homeschool her kids and preparing the family for the High Holidays. When Hurricane Harvey hit, she helped evacuate 150 people from her neighborhood by airboat, and shelter nearly 100 people in a local religious center. For the past three weeks, Davies has been leading a force of up to 300 volunteers who have mobilized to repair homes and synagogues in and around the heavily Jewish housing development of Willow Meadows. Davies has spent September coordinating teams who are clearing Sheetrock, stripping floors, preventing mold, and distributing aid. Her volunteer operation is headquartered in Beit Rambam, a Sephardic synagogue which was spared flooding, and has helped rehabilitate the homes of about 100 families. But Davies is also helping lead the effort to make sure those families have a place to pray when Rosh Hashanah (Jewish New Year) begins Wednesday. As the entire Houston area recovers from Harvey, synagogues face the added difficulty of drying out their buildings days before the holiest and busiest days of the year. Three large synagogues sustained substantial damage from the flood, forcing them to improvise, relocate or make do with whatever floors, books and ritual objects remained intact. Strauss said his synagogue sustained about $3 million worth of damage. Along with cutting out floors, cabinets and Sheetrock, and disinfecting the building -- the basics of flood recovery -- the synagogue will have to bury nearly 1,000 holy books which were ruined in the flood. The synagogue will set up a Harvey memorial at the burial space. 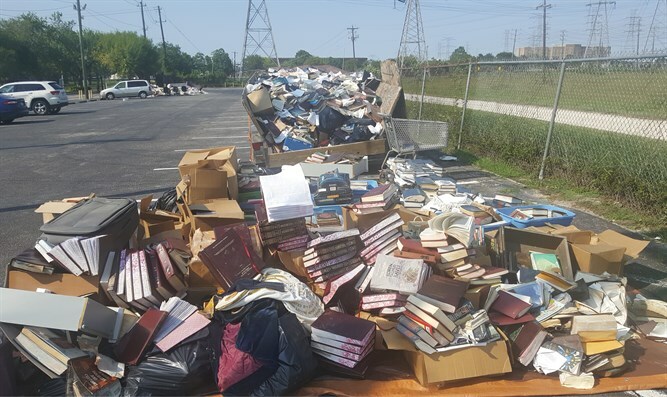 United Orthodox Synagogues, another Houston congregation, had up to six feet of flooding in some places and also lost most of its prayer books. 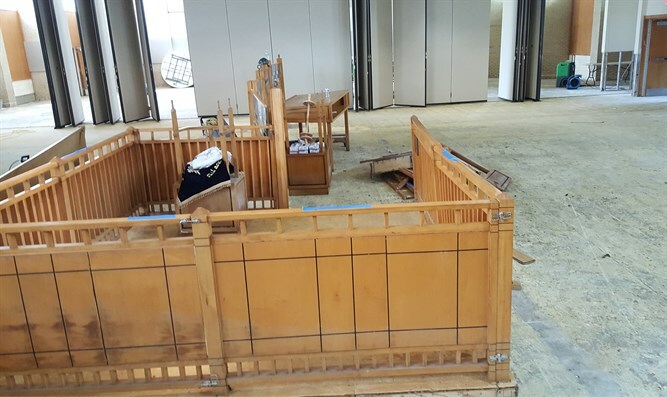 Congregation Beth Israel had damage in its sanctuary, mechanical room and offices. No Torah scrolls were damaged at any of the congregations, as they were in high places when the flooding began. United Orthodox isn’t sure if the building can ever be completely repaired, while Strauss is shooting for his building to be back to normal for the High Holidays -- in 2018. In the meantime, the synagogues have found makeshift solutions. United Orthodox’s 300-some families have been praying, meeting and eating in a large social hall that avoided the worst of the water. The synagogue has also had hundreds of new prayer books donated from publishing companies and synagogues outside Houston, including 400 machzors, or High Holidays prayer books. Beth Yeshurun has been holding bar and bat mitzvah services in a nearby high school auditorium, and otherwise has joined with Brith Shalom, a nearby Conservative synagogue that was not flooded. The rabbis have handled their synagogues’ recovery while also dealing with personal crises. Both Gelman and Strauss had flooding in their houses. Gelman, along with a few dozen Jewish families, has moved to an apartment complex near the synagogue that he now calls a “kibbutz.” Other religious families are hosting displaced neighbors who want to stay within walking distance of their synagogues. Houston’s Jewish community has also been buoyed by outside donations. Aside from approximately $9 million raised by the local federation, Israel pledged $1 million in aid, and the Orthodox Union and Chabad also sent money and volunteers. A kosher barbecue food truck from Dallas drove down and has been making up to 1,000 meals a day. Seasons, a kosher supermarket chain, and Chasdei Lev, a charitable organization in New York, sent trucks of kosher perishable items and dry goods, including clothes. “Food is getting semi-back to normal,” said Tzivia Weiss, executive director of the Houston Kashruth Association. The flood has also affected what’s usually troubling rabbis the most ahead of High Holidays -- their sermons. Strauss, who was going to talk about pressures affecting teens and young adults, will instead be discussing his family’s personal experience during Harvey and how to avoid fixating on material possessions. Gelman will talk about the connection between homelessness and repentance, as well as how to respond to the flood while thinking of the future. Piles of ruined books from United Orthodox Synagogues of Houston.